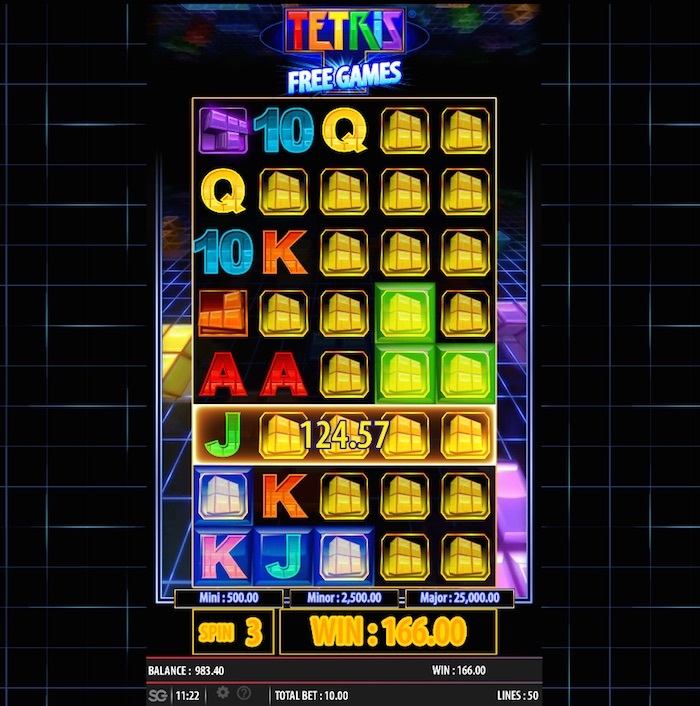 Playable from 50p to £100 a spin, Tetris Super Jackpots is a 5 reel online slot with 243 ways to win. Based on the popular Tetris game from the 1980’s, the slot includes random Tetriminos that fall to produce wins and a free spins bonus that uses 8 rows. It’s also got mini, minor and major jackpots up for grabs. This is also the slots main attraction. Who doesn’t like Tetris? It’s addictive, retro and enjoyable. Now add the money! That’s the appeal behind Tetris Super Jackpots from Scientific Games. It’s the arcade classic in online slots form, made for casino; it’s Tetris for prizes, real prizes. And that’s what’s clever about Tetris: Super Jackpots, you can win money playing Tetris. I’ve scanned some of the best UK casinos for new slots and the Tetris Super Jackpots slot crops up as a featured game everywhere. There’s a reason it’s popular. For one it’s got 243 ways to win, there’s spins from just 50p and then there’s the music, my favorite thing about the slot. It’s clever, cool and 80’s retro in its purest form. And while some players might not like the smaller game screen, it’s necessary for the main event within it, Tetris and Tetriminos. It’s not everyday there’s three jackpots to play for and a free spins bonus with wins that formulate a game of Tetris. This might be one of the coolest slots to date. It’s repetitive, but most slots are and so is Tetris. But Tetris: Super Jackpots is colorful, engaging and most of all, exciting. Scientific Games have mixed the DNA of Tetris with the ‘what if’ of winning money, that’s something, we can’t ignore. How much can you win playing Tetris Super Jackpots? The Tetris Super Jackpots slot might not have the biggest pay table on the block, but there’s lots of ways to win. At 95.80%RTP payout rate, there’s scope for lots of wins. But very few of those wins will be worth much looking closely at the Tetris slot pay table. That said, it’s the jackpots that matter most in this game, not the crummy wins from the pay lines. So how much can you win playing the Tetris Super Jackpots slot? This is my favorite part. We’ll answer the question for both the lowest and highest bets you can make. pay £25.00, the minor jackpot £125.00 and the major jackpot would be a whopping £1250.00. Play bigger and the winnings get bigger too, but they’re still relatively poor. You’d now be playing at £100 a spin to win a measly smallest prize of £4.00 for your efforts. That’s if you win at all! The largest pay table prize would pay £300. But remember, Tetris is all about the super jackpots. And at £100 a bet, they do get pretty super. Playing Tetris Super Jackpots at £100 a spin would return a mini jackpot of £5000, a minor jackpot of £25,000 and a major jackpot of £250,000. While the slots single line win amounts might be minimal, the Tetris Super Jackpots features make up for any shortfalls on the pay table. Using Tetriminos (Tetris Blocks), Free Games and Multiple Jackpots, there’s enough here to keep things interesting. Firstly, the Tetriminos feature can activate at random placing a number of Tetriminos on the reels or above the reels. When this happens, all symbols covered with a Tetrimino will change into a standard Tetris block. You can add up to four extra rows in this game resulting in additional chances of winning. Next up, it’s the Tetris free games bonus. That’s right! Free spins Tetris style. So what does this mean? Think back to the Tetris game and you had falling blocks (Tetriminos). It’s the same thing. You’ll need to get scatters on the middle three reels to activate this bonus. The game then expands to 8 rows and the spins begin. This free games bonus is all about wins generating further possible wins! That’s because winning combinations create Tetrimino Watermarks. These Tetris blocks then fall down through the reels (Like in Tetris the Game). You get the idea; winning combinations will disappear until the Tetrimino Watermark reaches the top of the reels. This feature game has the potential of carrying on for some time, generating some big wins. Finally, this is why you play Tetris Super Jackpots. Ok, the music’s cool and we like the throwback design. But payout power is the name of the game. Not one, but three jackpots worth playing for, mini, minor and major, worth 50x, 250x and 2,500x your betting stake respectively. You’ll only be able to win these from within the free spins bonus game, and you’ll need the Golden Watermark symbol to do it. Who knows what you could win here. It could be a minor, mini or major jackpot. Again, rows of Golden Watermarks will be helpful. The game of Tetris is one of the world’s most famous and well loved games. 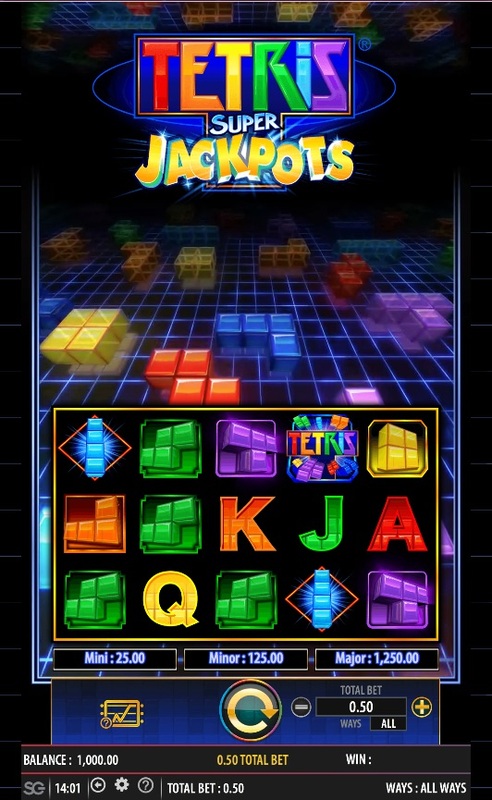 Tetris Super Jackpots from Scientific Games adds money to the 1980’s invention of block building with a good free spins bonus and with multiple jackpots up for grabs. With retro vibes, funky beats and Tetriminos, this is one of my favorite new online slots.